These photos of the De Dion Bouton factory – 1905 above and 1908 below – were taken before the company made bicycles themselves. Of the many French marques with historic significance, De Dion Bouton was the most influential. By 1882 the company had already produced a self-propelling steam car and in 1890 patented a single cylinder petrol engine. Most of the early car manufacturers started out as bicycle manufacturers. No doubt because of their early innovations with steam and petrol engines, De Dion Bouton’s cycle production appears to have started only in 1909. This De Dion Bouton ‘Modele Routier’ is the company’s first model. It is in superb condition, with little use, having spent most of its life in a museum in Jersey, until it was purchased by the previous owners 9john and Stella) in 2002 when the museum decided to downsize. It has a splendid transfer (decal) on the down tube, and is in its original paint. Apart from some rubbing to the front fork where John fitted a a front brake the paintwork is still in very good condition. The rear brake is a contemporary item, as is the Ideale saddle. The original nickel on the bicycle is superb, as are the wheel rims. Though undoubtedly one of the world’s most important motoring pioneers, De Dion Bouton is not so well-known as a bicycle manufacturer. Nevertheless, their bicycles were made with as much attention to quality as their tricycles and automobiles, and could be considered the ‘Rolls Royce’ of French bicycles. Most of the cycle components were made in-house, and their hubs have a stamp with the De Dion Bouton initials ‘DB’. The company had already been manufacturing tricycles for some time before adding bicycles to their sales line; they often sold trikes unbadged to allow other companies to mount the engines and market them under their individual names. I’ve never seen any catalogues from the first year of cycle production, apart from the 1910 details above. The article below, published on 25th February 1911, states that the company decided to make bicycles around eight months previously. It illustrates two styles of handlebar, with and without rod brakes. The 1910 illustration above shows no brakes – the same as the bicycles featured here – so I assume the model with rod brakes was introduced in the second year of production. De Dion Bouton displayed bicycles on their stand at at the 1911 Expo Locomotion Grand Palais, which evolved into the renowned airshow. 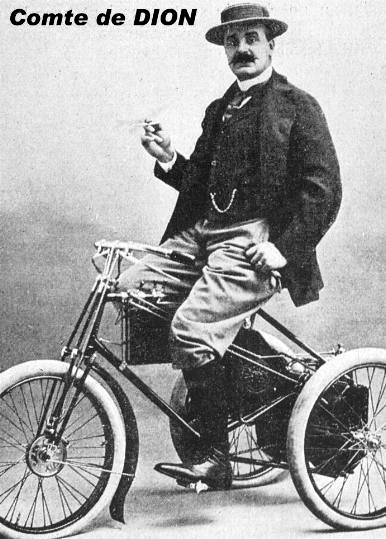 The French were pioneers of flight, and of course flying’s early years involved bicycles. The nickel on the hubs and fork tips (above) is excellent. The oil caps are made by Perry Ltd of England, and show their stamping on top. Marquis Albert De Dion was an industrialist and automotive genius. He pioneered many ‘firsts’ for the automotive industry and recognized the power and potential of the gasoline engine. He teamed with Georges Bouton, an engineer, and together they produced a self-propelled steam vehicle in 1882. To improve the ride of the vehicle a light rear axle was invented and later patented under the name ‘de Dion’. In 1890 they patented a gasoline single cylinder engine and in 1895 they were producing vehicles. The single cylinder engine was also used to power sporting tricycles until 1901. THE END: With national tragedies such as World War I and the onset of the Great Depression, the company struggled financially. During 1927 it ceased production temporarily and when it resumed it had a new 2.5-liter straight eight-cylinder and a 2-liter four-cylinder engine. Sales were sluggish so the decision was made to increase the displacement to 3-liters in 1930. The final car produced by the De Dion Company was in 1932. The company continued to make trucks through the 194os and, at the end, serviced cars, trucks, and motorcycles. DE DION LE BLANC: Company names have always been a marketable commodity, and reputable car, motorcycle or bicycle manufacturer marques were often purchased after the company itself ceased trading. The De Dion Bouton name was bought by Dilecta in 1935 and, after WW2, Dilecta badged some of their bicycles and cyclemotors as De Dion Bouton le Blanc.